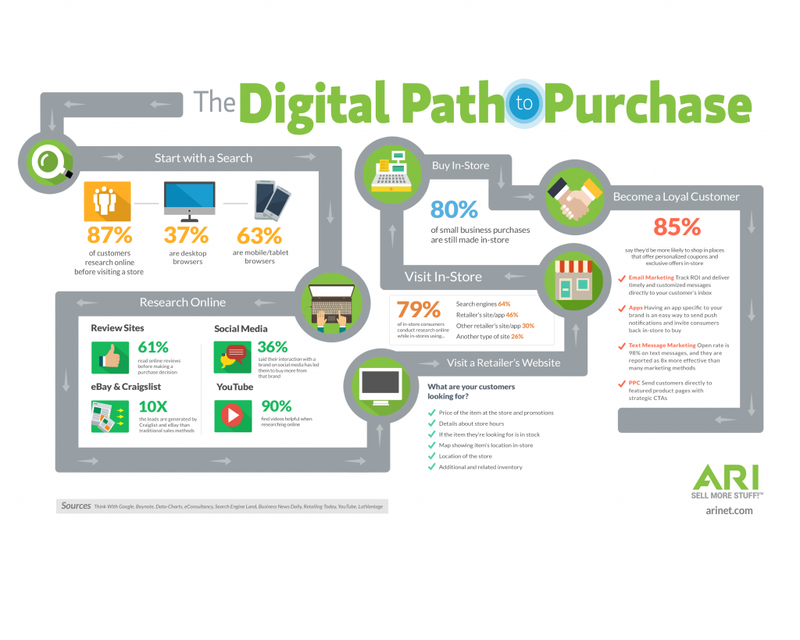 How much has the consumers path to purchase evolved? Market conditions, increased competition and changing consumer expectations and demands makes growth harder than ever to generate. Consumers only had a few ways to learn about the products they were buying – television, print, word of mouth – and buying mainly happened in a brick-and-mortar store. The marketplace has drastically evolved, there is an ever-expanding number and variety of channels, and an array of devices for consumers to use as they move along the path to purchase. We can safely say that the path to purchase is no longer a linear path – prospects don’t come in the top and out the bottom, they come in at various stages, and will often jump stages, stay in a stage indefinitely, or move back and forth between them. By taking advantage of search engine optimization, maintaining strong social media profiles and optimizing your website, you can help turn casual shoppers into loyal customers. What’s changed is instead of marketers feeding information to customers, customers are now finding the information on their own and it is the marketer’s job to pull that audience in by creating an experience that resonates with them. While there is no step-by-step proven plan that will work for every industry and every situation, there are some best practices that can help companies better relate to their customers throughout their path to purchase. It’s likely that your audience doesn’t fall into one narrow category, so why would you have your content fall into one narrow category? You should be catering your content towards what your audience is looking for and through the channels that they are looking. Write a blog, and then expand that idea into a high value white paper for someone who is more interested in the subject. Take some facts out of your blog and create a related infographic and short video that explains the concept visually. Create engaging content like assessments, workshops, games, and contests that will keep people clicking, swiping, and sharing. Create content that works across channels and make sure all your touchpoints are linked seamlessly. While some paths to purchase are quick, some take much longer and marketers must nurture prospects for months or years before they turn into sales opportunities, so it is critical to stay engaged throughout the entire buying cycle. Personalized marketing through emails, custom landing pages, and advertisements continues to be a great way to drive action and behavior through the customer’s path to purchase, but as personalization develops, customers will expect more to come out of it. As customers move closer to the point of purchase, businesses will need to have more knowledge about their interests and behaviors to improve communication. Customers expect emails and social media interaction to be relevant to their interests, and customers will increasingly expect custom information and offers. Like it or not, the customer’s path to purchase is moving more towards mobile. I don’t know about you, but my own phone has more than 20 apps that allow me to directly purchase a product with the swipe of a finger – everything from dinner, to spa services, to flights, all at my fingertips. I’m not alone. According to a Statista Report, in 2021, 53.9 percent of all retail e-commerce is expected to be generated via mobile-commerce. As of February 2017, Amazon was the most popular shopping app in the United States with a mobile reach of 40 percent, ranking ahead of local competitors Walmart and eBay. The numbers speak for themselves, your company needs to be mobile friendly. Looking to improve your e-commerce sales? Check out our blog: How to Build a Mobile-Centric Search Strategy. All your audience, personalization, content, and mobile efforts may be in vain if your audience can’t find you when they need to. Search engine optimization (SEO) helps your business get found online at the right time by the right people. SEO works behind the scenes to help increase performance and visibility organically, so your business will show up higher in relevant online search results. Working alongside SEO should be a solid SEM strategy. Focused pay-per-click campaigns, along with search retargeting campaigns, can grow your audience and bring customers straight to your door. What are the best tactics to get your e-commerce site to the top of the rankings? Check out our blog: SEO Best Practices that Could Improve Your e-commerce Sales. These best practices, along with other possible strategies specifically tailored to your industry, are often implemented together to create a full-blown digital marketing plan that can easily improve your ROI. At Advance Ohio, we already did the work for you: we know your audience and we have proven solutions to help your business reach its full potential. Contact us today to let us build your company’s personalized digital marketing strategy.